The New York City Panel on Climate Change (NYCPCC), released last month, its 2019 report on the science of climate change and its implications for New York City. The report finds that climate change is affecting everyday life in New York today, and that climate impacts will continue to increase over the coming decades, hitting the poorest neighbourhoods hardest. The NYCPCC, which has been helping NYC prepare for climate change since 2008, found that extreme weather events are becoming more pronounced, high temperatures in summer are rising, and heavy downpours are increasing. The report finds that areas with lower incomes and the highest percentages of African American and Hispanic residents are consistently more likely to suffer the impacts of climate change. The panel advises that community engagement is critical for more effective and flexible adaptation efforts in the most at-risk communities. The report serves as a “further wakeup call on the need to move urgently and take action on climate change” according to New York’s mayor Bill de Blasio. “This [report] shows what New Yorkers learned acutely during Sandy – climate change is real and an existential threat,” he said. Records show that maximum daily summer temperatures have been rising at rates of 0.5°F per decade at JFK Airport and 0.7°F per decade at LaGuardia Airport since 1970. Sea level recorded at The Battery in lower Manhattan continues to rise at a rate of 0.11 inches per year since 1850. These changes are broadly in line with the climate change projections made by the NPCC in 2015. The report also emphasises that climate change is already affecting the daily life of NYC residents, especially for those who live in coastal communities where nuisance flooding is becoming more frequent and for those who operate and use the city’s critical infrastructure during heatwaves and heavy downpours. Economic losses from hurricanes and floods have significantly increased in past decades and are likely to increase further in the future from more intense hurricanes and higher sea level rise. One of those tools is the Antarctic Rapid Ice Melt Scenario, which the NPCC created to model the effects of melting ice sheets on sea level rise around NYC. The model predicts that under a high-end scenario, monthly tidal flooding will begin to affect many neighbourhoods around Jamaica Bay by the 2050s and other coastal areas throughout the city by the 2080s. To help manage the dynamic climate and public policy contexts, the NPCC 2019 report recommends that the city put in place a coordinated indicator and monitoring system to enable the city and its communities to better monitor climate change trends, impacts, vulnerability, and adaptation measures. The report also notes that property insurance can be a catalyst for infrastructure resilience by encouraging investment in adaptation measures prior to a disaster through a reduction in premiums. hosting a NYC Climate Summit once during every mayoral term. Extreme temperatures can have a significant impact on the risk of developing cardiovascular complications, a new study suggests. Researchers from Ludwig Maximilian University in Munich, Augsburg University Hospital and Nördlingen Hospital, found that high temperatures are a contributing factor to heart attack rates, and suggests climate change may have increased the risk. It has long been assumed that severe spikes in temperature increase the risk of heart attack. “In the case of very high and very low temperatures in particular, this has been clearly demonstrated. In this latest study, we wanted to see to what extent the heat and cold-related heart attack risk has changed over the years,” explains Dr. Kai Chen, researcher at the Institute of Epidemiology at Helmholtz Zentrum München. The research team looked at over 27,000 heart attack patients between 1987 and 2014. The individual heart attacks were compared against meteorological data on the day of the attack and adjusted for a range of additional factors, such as the day of the week and socioeconomic status. “Our analysis showed that, over the last few years, the risk of heat-induced heart attack with increasing average daily temperature has risen compared to the previous investigation period,” explains Chen. Individuals with diabetes or hyperlipidaemia were particularly at risk over the latter period. The researchers suspect that this is partly a result of global warming, but that it is also a consequence of an increase in risk factors such as diabetes and hyperlipidaemia, which have made the population more susceptible to heat. Cover photo by Benjamin Voros on Unsplash. For the first time in its history, the World Ocean Summit was held in the Middle East. Last month, Abu Dhabi hosted the sixth edition of the event, which is organised each year by the Economist Group’s World Ocean Initiative. The three-day conference highlighted the threat posed by climate change to the world’s oceans, and drew attention to water-related climate risks to the United Arab Emirates (UAE) and other Gulf States. Sea level rise in particular is a significant concern for the UAE, where almost seventy percent of the country’s gross domestic product is dependent on the ‘blue economy’ (including fisheries, maritime transport, renewable energy and tourism). “Any sea level rise is going affect a huge part of our coastal areas. Almost 80 percent of our population is living in coastal areas, so their communities are going to be destroyed,” said Thani Al Zeyoudi, the United Arab Emirates’ Minister of Climate Change and Environment, speaking to CNBC news last month. The UAE is amongst the most vulnerable countries in the world to climate change. Over ninety percent of its infrastructure is coastal, and estimates suggest that the country could lose as much as 6 percent of its developed coastline by the end of the century. Al Zeyoudi also listed water scarcity as a major risk for the country. “Water scarcity here in the region and the droughts is affecting most of the sectors, especially agriculture, so that is why most of our food is imported from abroad,” he said. Al Zeyoudi’s interpretation is supported by the UAE’s recently released, climate risk assessment, published in January buy the Ministry of Climate Change and Environment. The report says that the country faces very significant challenges to adapt to a climate that “may impose new and overwhelming pressures on the country’s environment, economy, and society”. The climate risk assessment considered how climate change phenomena could affect four sectors – human health, energy (electricity and heat), infrastructure, and the environment. Ten priority climate risks were identified which were rated very high or high according to the risk assessment framework developed for the analysis. The highly interconnected nature of the climate risks means that adaptation and resilience building measures need to be considered across all government departments and economic sectors. This will require increased ambition from the UAE’s in terms of its response to climate change. Its nationally determined contributions (NDC) to greenhouse gas emissions reductions made under the UNFCCC, were rated as ‘insufficient’ and its current policies on adaptation are not sufficient to protect the country from future climate shocks. Cover photo by Harland Arlander on Unsplash. For the fourth year in a row, the United States has ranked 15th in the University of Notre Dame’s Global Adaptation Initiative (ND-GAIN) Country Index. The annual index ranks 181 countries on vulnerability to extreme climate events such as droughts, superstorms and other natural disasters as well as readiness to successfully implement adaptation solutions. Since the index launched in 1995, the U.S. has trended each year at or below its previous ranking, except for 2013. This information comes on the heels of volume two of the fourth National Climate Assessment from the U.S. Global Change Research Program, which states that the country’s expanded mitigation and adaptation efforts over the years have not yet risen to the level necessary for avoiding substantial damages to the economy, environment and human health. Patrick Regan, associate director of the Environmental Change Initiative for ND-GAIN and professor of political science at Notre Dame, said the ND-GAIN Country Index’s data suggest that adaptation needs to take a much more central focus across our cities and towns. In 2018, ND-GAIN launched the Urban Adaptation Assessment (UAA) to support cities within the U.S. whose populations are above 100,000 in their prioritization of adaptation efforts. The UAA is a free, open-source measurement and analysis tool that explores a city’s ability and readiness to adapt to climate change. Through detailed visualization of adaptive capacities and social vulnerabilities at the sub-city or neighborhood level, the UAA can inform the development of strategies and adaptation preparedness across communities. ND-GAIN’s full country ranking, country profiles and visualization tools are available at gain.nd.edu/country, while the UAA database, funded by The Kresge Foundation, can be found at gain.nd.edu/urban. This article was originally published on Notre Dame News. Editor’s note: Kolkata and the Sundarbans face a deadly melange of climate change impacts: intensifying heat waves and rainfall extremes, an exceptionally rapid rise in sea levels and intensifying cyclones. Chirag Dhara, a climate physicist, visited Kolkata and the Sundarbans in November 2018. He interviewed a wide cross-section of people – college students and professionals, taxi drivers and street dwellers – on their experience of changes in their city’s climate. He also spoke to experts and activists working in health, science and environment. This five-part series integrates public perception with expert opinion. 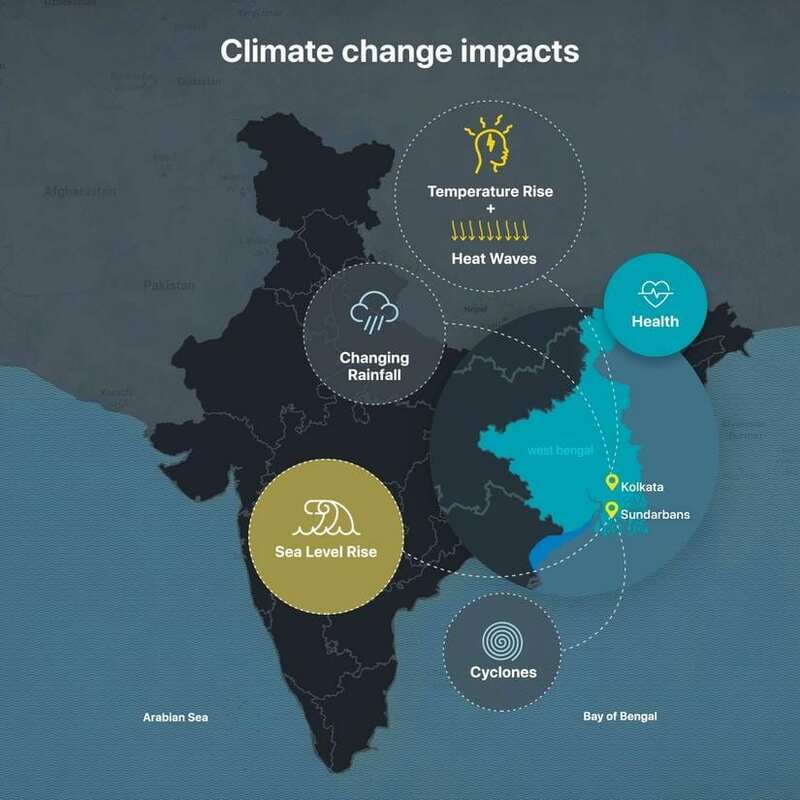 It contextualizes local climate trends within country-wide and global trends, using photographs, videos, satellite imagery, infographics, concept schematics and the latest developments in climate research. Important scientific concepts have been simplified to better explain the causes and consequences of these changes. This is the third part of the series. The photographs above of a school on the edge of Sagar Island, in the Indian Sundarbans, were taken less than four years apart. Classes were in full swing when Nagraj Adve, a climate change activist and writer, visited in early 2014. At the time, the school was a few hundred metres from the water line. 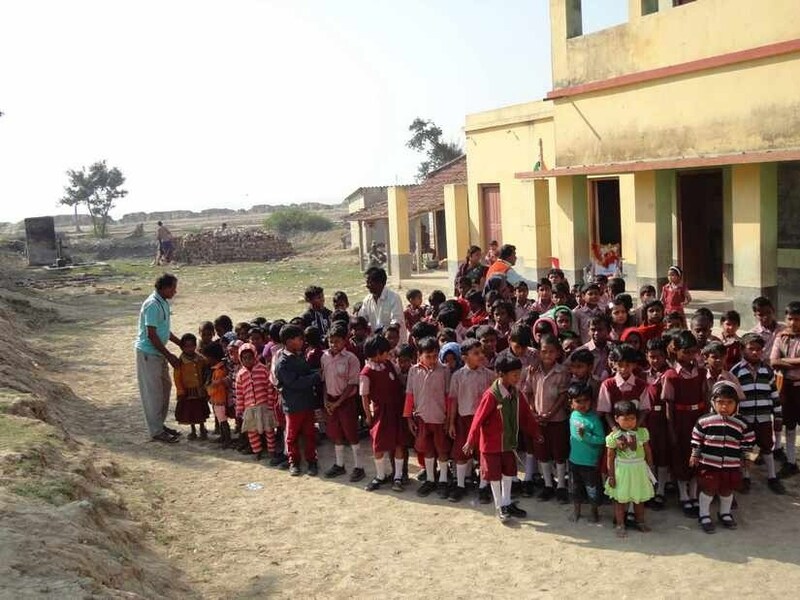 While it was not uncommon even then for high tide waters in the monsoon to reach the school, waters in the Bay of Bengal have swelled so rapidly that the sea has now completely swallowed the school and intrudes a hundred metres beyond it. The school has moved half a kilometre further inland as have families that chose to continue living on the island. Others have left, now effectively climate refugees. Sadly, the plight of the school is the rule, not the exception, in many parts of the Sundarbans. The two overlaid images of the Sundarbans below were acquired by NASA satellites 19 years apart. A cursory visual inspection is all it takes to see how the coastline has eroded almost everywhere along the Bay-facing coastline. Some small islands have gone completely under. Why is the Sundarbans eroding away? What does its future hold? To what extent are we — humans — responsible for these children having lost their school? The rise in global sea level on average from 1993 – present. Data source: Satellite sea level observations. Credit: NASA Goddard Space Flight Center. Sea levels have been rising in all the world’s oceans for the past century. There are many natural reasons why sea levels change, but also two major ways in which human-induced global warming is impacting sea levels today. For one, with rising temperatures, trillions of tonnes of ice have melted in the past century from glaciers and ice sheets on Greenland and Antarctica because of global warming, adding vast quantities of water to the oceans. A time lapse of Earth for the past 32 years showing how glaciers are declining. Ice loss from Greenland and Antarctica are not evident in these images because these ice sheets are kilometres thick. Please see the Q&A section below for details. Data: NASA’s Landsat, ESA’s Sentinel 2A satellite imagery among others. Visualization: Google Earth Engine. For another, water expands as it warms causing the same quantity of water to occupy more space. The combined effect of these two processes is a rise in global sea levels of about 3 mm/year on average. Q&A: How are Greenland and Antarctica contributing to sea-level rise? Greenland in the northern hemisphere and Antarctica at the south pole each hold enormous quantities of frozen fresh water in their kilometre(s)-thick ice sheets. 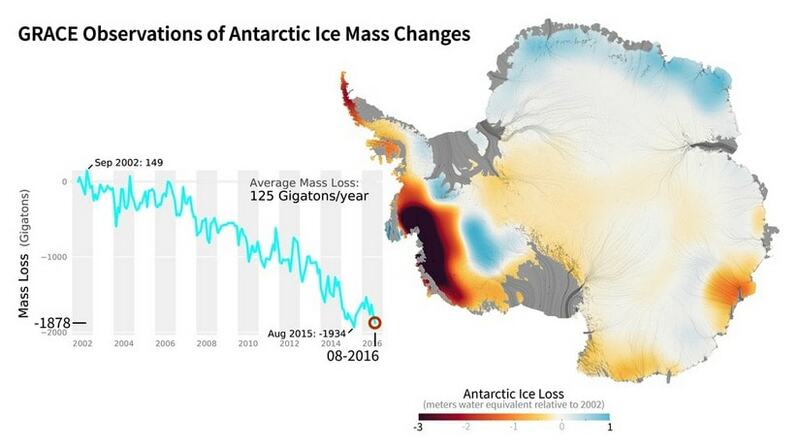 As global temperatures rise, these ice sheets are rapidly melting, adding water to the world’s oceans. 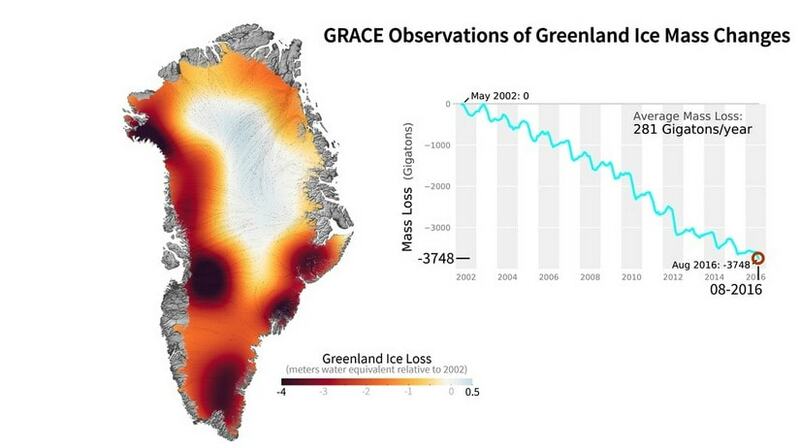 Satellites monitoring ice thickness found that nearly 2 trillion tonnes of ice has melted from Antarctica while Greenland has shed nearly 4 trillion tonnes in 14 years of observation alone (2002 – 2016). In addition, water expands as its temperature rises, as do most substances, in a process called thermal expansion. This causes the same mass of ocean water to occupy more space at a higher temperature contributing yet more to sea-level rise. Thermal expansion of water for even a small temperature rise so important that it is considered the single biggest cause of anthropogenic sea-level rise in the long run, even more important than ice-melt. The combined effect of these phenomena has been to raise global sea-levels by about 3 mm/year on average in recent decades. However, the seas are rising considerably faster in some of the world’s oceans than in others. Natural factors such as how heat is transported by ocean currents and periodic climatic phenomena such as El Niño are some major reasons for why regional differences in sea-level rise come about. Yet, global warming plays into this as well. 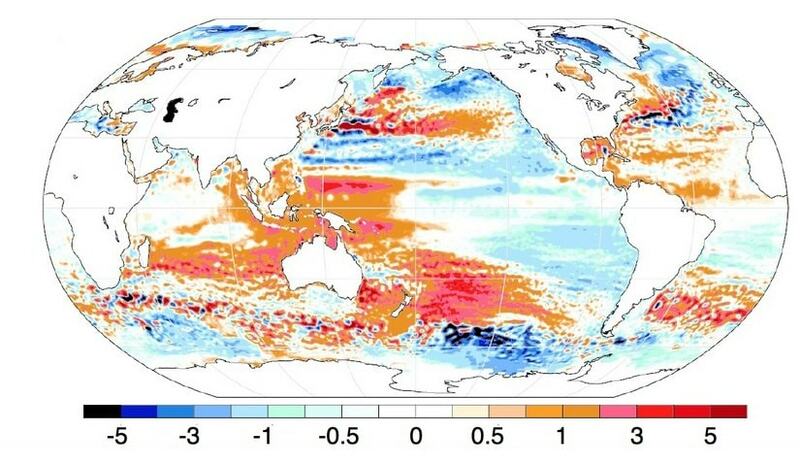 Temperatures are rising faster in some parts of the world’s oceans than others. Consequently, water expands faster swelling the seas more rapidly in those regions. Primarily for this reason, waters of the Bay of Bengal have been rising up to twice as fast as the global average at about 4.4 – 6.3mm/year. Unhappily, physical features specific to the Sundarbans and extensive upstream damming of the rivers flowing into it has combined to make the situation even graver. Q&A: Why should a few mm/year rise in sea level be of concern? A sea-level rise of 3 mm per year may not seem like much. Yet, it can produce significantly greater inland sea water intrusion over time especially in low lying coastal areas. The gently sloping area adjoining the coast is called the Continental Shelf, where the average downward slope is only about 0.1o. The 3 cm rise that would occurs in a decade, at current rates of sea-level rise, would cause sea levels to intrude further inland by a disproportionately larger 17 meters (65 feet). 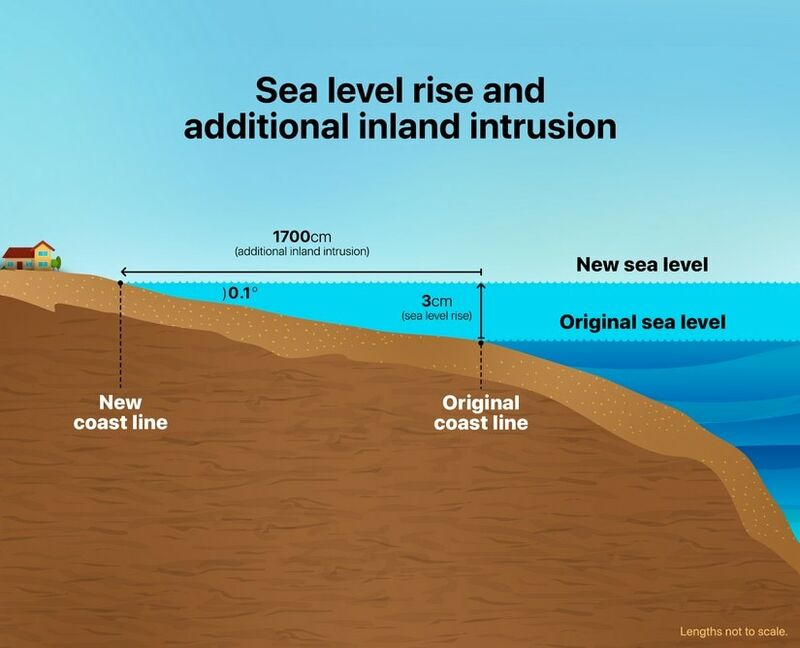 Sea levels today are about 20c m higher than pre-industrial times (1850s) meaning that land has ceded about 115 metres to the sea in coastal areas with gentle elevation. The Intergovernmental Panel on Climate Change (IPCC) special report released in October 2018 warns that sea levels may rise up to 77 cm by 2100 even if global temperatures rose “only” to 1.5 C in the next 80 years. The reality we are presently facing is far worse. We are currently on track for temperature rise of 3 to 4 C by 2100. Contours of river deltas are naturally dynamic being shaped by sediment deposition by the vast amounts of soft, fertile silt transported by the rivers constituting them. Land accretes by sedimentation, but is lost by silt compactification and coastal erosion. Sediment transport into the Sundarbans has been severely affected by upstream damming, especially the Farakka dam in West Bengal built on the Ganga in 1975. Dams trap sediment and greatly reduce downstream transport. As a result, subsidence have outpaced accretion on average in the Indian part of the Sundarbans and the Delta is sinking at a rate of about 2 to 4mm/year. The combined effect of already high rate of sea-level rise in the Bay of Bengal and land subsidence has been an effective sea-level rise in the Sundarbans that is nearly three times as fast as the global average (~ 8mm/year), and as high as 12mm/year on Sagar Island. The consequences are all too obvious and exactly what has occurred: Satellites have found the sea advancing by a staggering 200 metres (650 feet)/year in parts of the Sundarbans, and a total of 170 square kilometres (the size of Kolkata city) has surrendered to the sea in the 37 years between 1973 and 2010 alone. These are facts that students and teachers of Boatkhali Kadambini School need little convincing about. Higher sea levels have devastating impacts on low-lying coastal habitats, and the Sundarbans is one of the most densely populated yet biodiverse ones in the world. 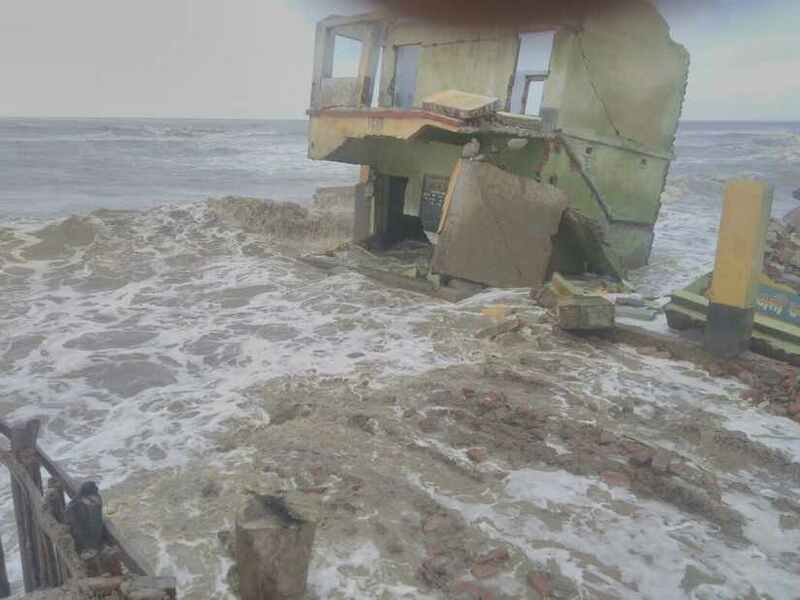 Aside from the school on Sagar Island becoming permanently inundated in a space of merely four years, the entire stretch where there were houses and agricultural land has been swallowed by the sea. The large-scale destruction of Mangroves has exacerbated coastal erosion. The surging seas have turned fertile agricultural lands and groundwater increasingly saline. Families are moving inland or leaving the island entirely, often to big cities like Kolkata, effectively becoming climate change refugees. There is yet another tragedy in store for the Sundarbans. A study focusing on the Bangladeshi Sundarbans (contiguous with the Indian Sundarbans) found that the remaining Tiger habitat and population would be almost entirely wiped out for a 28 cm rise in sea levels above the 2000 levels, which is likely to happen in the next 50 to 90 years. Sea levels are expected to continue rising with increasing intensity in the Sundarbans. The fate of the Boatkhali Kadambini Primary School is an early warning sign, a precursor, of the devastation the Sundarbans faces. It is the fate that awaits all life in the Sundarbans, humans and animals alike, if we do not heed these signs and act at once to adapt if not to mitigate.